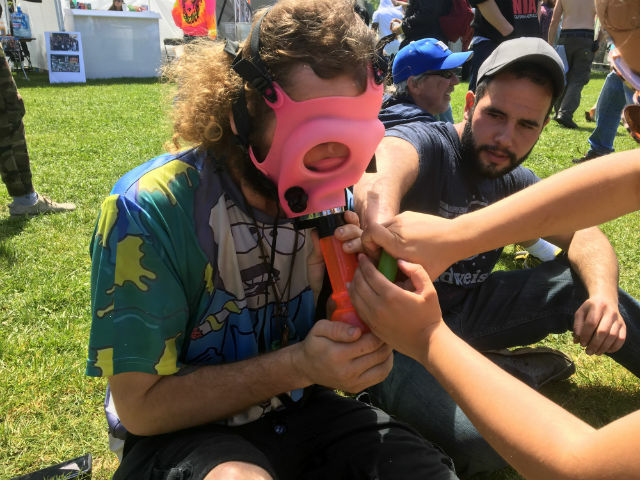 The objective was to get as high as possible, as Hippie Hill and Sharon Meadow were transformed into a giant outdoor weed-dispensary-slash-Grateful Dead-parking-lot scene. 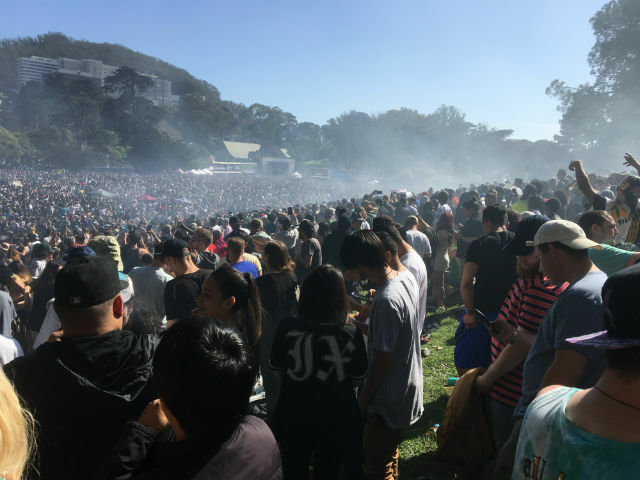 That is pure marijuana smoke blanketing the crowd, precisely at 4:20 p.m. on 4/20 and creating a remarkable cannabis cloud. This year’s new restrictions banning unpermitted vendors, glass, tents, canopies, and tables were all completely ignored. Anyone who could get their items past security (how did he get this past security?) could get away with indulging, selling weed, or drinking alcohol. 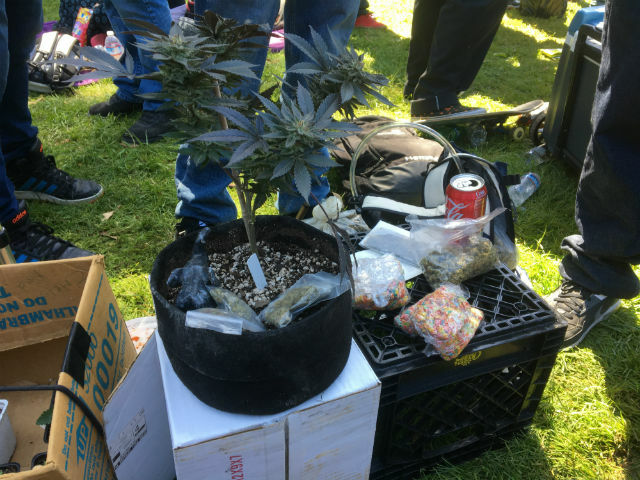 As you can see from this makeshift vending booth, single-bud zip bags, huge sacks of weed, and all manner of edibles were freely sold without permits or consequences. No way, what we should do is build walls to keep people out of our country and start wars with anybody who annoys us. That's much better than giving people freedom to do what they want. Welcome to teh Hotel California. Finally, Wally's talking some sense, because everyone knows it's Trump who started the war in Syria! And remember when Trump said he not only wanted to build the wall against the Mexican border, but how he planned to wall off the Entire Country? Even build a Seawall? tabby why do you hate black people? So you hate black people because you think they are criminals? Colonies probably should never have been started in Africa. > Competitive in the future. Tabby, you suffer from cognitive dissonance. Actually, it's a fact that it's a good explanation. Wally, is that you on the pic? no. 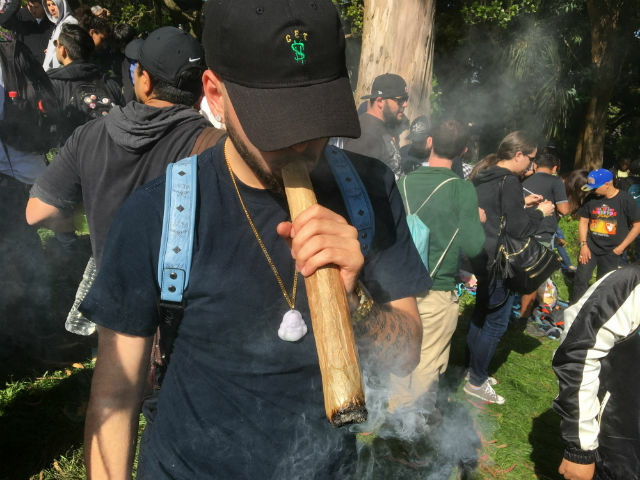 but i love that san francisco cops don't arrest people for smoking weed in public. it's like amsterdam. technically illegal but they're more likely to arrest jaywalkers than people smoking weed in a park. What do you think of the hashish which grows in north Morocco? I think that's what the street pushers sell in Hong Kong. If so, it's not bad. I prefer California green buds. ^ Wally, do you think smoking weed will make you violent or not law abiding in any way? "will breaking the law making you not law abiding?" aside from the breaking the law by smoking the weed (other than when it's legal), no. not at all. people who are stoned are the opposite of violent. alcohol makes people violent and prone to breaking laws. weed makes people want to play video games and eat. the quote from the San Francisco Police department confirms that. There’s a perimeter set up. Everyone’s staying within the perimeter. At this time, everyone’s behaving. Ya, that's because they are all stoned. 15,000 people all being nice and peaceful. If they were all drunk it would be very different. How was my accusation false? Also, why should California become Catlifornia? Wally thinks that only blacks live in the ghettos.